On July 21, 2015 we hosted Sean Sweeney to present a seminar at Communicative Health Care Associates on the topic of “Applying Technology to Support Social and Executive Functioning.” As a speech-language pathologist with additional background in instructional technology, Sean Sweeney focused this session toward helping participants analyze the features of apps and other resources that are dedicated to therapeutic purposes. Additionally, we looked beyond dedicated apps to creatively apply the features of apps designed for animation, video, drawing, comic making, or book creation toward building social and executive functioning. Apps dedicated to therapy in populations with social learning challenges often employ specially designed content to present social narratives. For example, Social Skill Builder’s apps (See Social Detective for an app aligned with the popular Social Thinking® methodology, or the Social Skill Builder app which has content spanning the needs of preschool to adult clients) use video situations along with questions to spur situational awareness and understanding of social norms. The Between the Lines series targets metalinguistics with audio, video, and photos accompanying questions for clients whose social understanding is impaired by difficulties with idioms, facial expressions and tone of voice. With conversation skills being a common functional target for this population, apps using audio recording around conversation topics with room for clinical scaffolding serve a great purpose; Mobile Education Store’s Conversation Builder and Conversation Builder Teen (also useful for adults) are terrific examples. As with any clinical area, apps for social skills therapy can be evaluated by clinicians to locate features and content suitable to clients. Given that these specialized apps range in cost, therapists will do well to research and locate reviews (see YappGuru.com as one source) and video tutorials on YouTube before purchasing. Goals targeting social aspects such as expected behaviors and scripts, perspective taking, and narrative benefit from extensive visual supports. 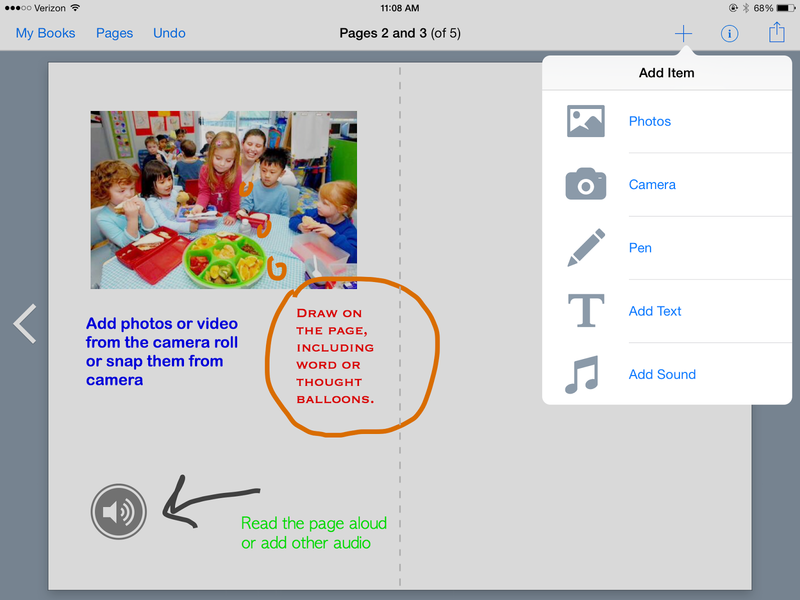 These can be created with a variety of free and low-cost apps. 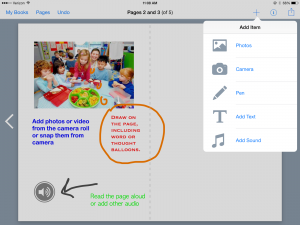 For example, if you are incorporating Carol Gray’s Social Story™ approach to target perspective taking and social behavior, stories can be created and shared through Book Creator, which allows for incorporation of text, audio, pictures and drawings in making an e-book shareable to your own or others’ iBook apps (for frequent review of stories with students), as well as printing. Perspective taking can be scaffolded though apps that create comics- the addition of thought bubbles being a key visual feature. As social behavior involves movement as well as verbals, use of iMovie to create and edit video, or creation of a narrative cartoon with Toontastic was recommended. Clients struggling with executive function deficits exhibit difficulties with self-regulation, planning, organization and time management. The session reviewed resources related to regulation such as Breathe, Think, Do by Sesame for younger students and The Zones of Regulation (a companion to the self-regulation program useful for school aged children up to adults), as well as apps for instruction in mindfulness strategies (see the Cosmic Kids series on YouTube and apps such as Stop, Breathe and Think). Visual planning for tasks can be accomplished by annotating and drawing on task photos in Doodle Buddy and Skitch, and support writing by teaching language organizational structure in Inspiration, a concept mapping app exportable to word processing software. Thank you Sean for this recap of app tools. For more suggestions on integrating apps in instruction for social and executive function, see Sean and Sarah Ward’s column and Sean’s blog.